At the Gold and Silver Pawn Shop in Las Vegas, Nevada there’s no telling what someone might bring in to sell or pawn, as seen in History’s ‘Pawn Stars’. Together, Rick, Richard and Corey Harrison, and Austin “Chumlee” Russell run the 24-hour pawn shop, haggling with customers while trying to determine items’ history and worth on a daily basis. 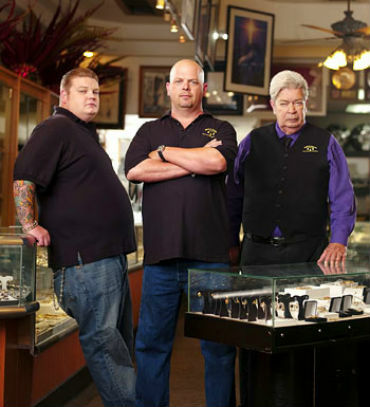 ‘Pawn Stars’ has become one of the most-watched reality shows since it premiered on History on July 26, 2009. It recently began its fifth season, with new episodes airing on Mondays at 9 pm EST, though you can watch every episode dating back to its series premiere for free online with FreeCast. New episodes of ‘Pawn Stars’ are available to watch online through your computer of mobile device the day after they premiere on History. In fact, the same is true for all the shows you want to watch for free online, not just ‘Pawn Stars’. FreeCast takes pride in being your personal online channel guide, as we want you to be able to watch all of your preferred TV programs absolutely free online. Visit FreeCast and start watching new and old episodes of ‘Pawn Stars’ at whatever time suits you best.